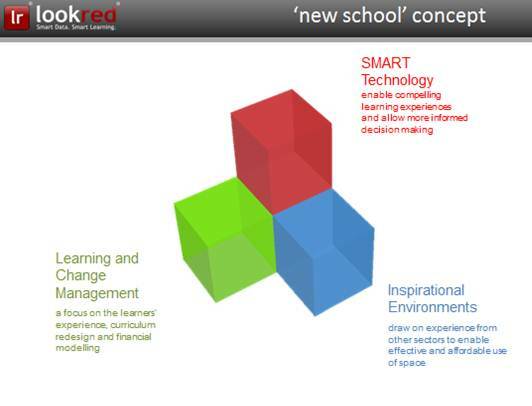 lookred® has recently become a winner of a competition launched by the Skolkovo Innovation Centre, to design the ‘new school’ concept. Skolkovo is the Russian Silicon Valley project where most of the world’s major technology companies are involved. Chris Poole, CEO of lookred® says: ‘The competition was strong as there were many entries from all across Russian Federation. There are 85k schools in Russia, and we are delighted to have been chosen to create a concept considering all aspects of school reform at a national scale’. lookred® are focused on the ‘smart’ technology element but have considerable experience from their backgrounds of the other elements namely, learning and change management as well as ‘inspirational environments’. The model lookred® has developed represents the vital inter-relationship between technology, people and space along with a clear view of how it can be implemented at scale. Winning the competition was another step in collaborative work lookred® has been doing with Microsoft Russia, the Russian Ministry of Education and 10 Russian regions for over a year to develop the design of the country’s school modernisation programme. The company has already established a data centre in Moscow and recently began a trial with a Moscow school of a localised version of their products.